We’ve exploded over the past year through a combination of organic growth and three strategic acquisitions. As a result, we’re now the #3 player in Enterprise Networking. So, like any rising star, we decided a world tour was in order. Extreme NOW is an epic tour with events spanning 55 cities throughout 22 countries. Thousands of customers have front row seats to hear from our top executives and back stage access to hang out with decision makers after the show for the inside scoop. “And I can’t stop ’til the whole world knows my name.” Not only is that a lyric from one of my favorite Fall Out Boy songs, Centuries; it’s a great way to describe Extreme NOW. 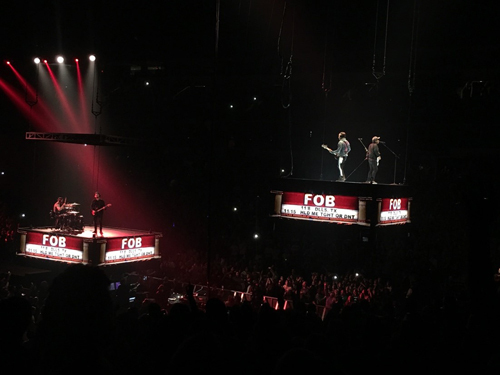 We went to see Fall Out Boy at the American Airlines Center right after I presented at the 2nd Extreme NOW event in Louisville, KY. As much as I’d love to say that the parallel between the two events was the reflection of Pete Wentz’s rock stardom in my own presentations, that’s just not the case. The truth is that what stood out to me about both were the crowds. As I looked around the AAC during the concert, I saw a mix of fans. There were fans that knew every word to all the old songs and picked up quickly on the new ones. Then, there were those that knew the radio hits or songs from certain albums and just danced along to the rest. Finally, there were people that had tagged along with someone else but clearly weren’t that familiar with the music themselves. In the end, the band put on a great show, sold a lot of t-shirts, and introduced the audience to the newest music, while still giving them the tried and true songs that they loved. We see familiar faces that have been buying from one company or another in the Extreme lineage for years under different logos. They attended to make sure their interests will continue to be served, to see if the new company will help address any of the challenges they’ve faced, and to learn what additional options they have under the expanded portfolio. They listen intently, banter with us like family during Q&A, and schedule 1:1s after the main show to talk about specifics. They want to buy Workflow Composer to automate their x870s and other infrastructure. They’re ready to rip out competitors that have held a niche in their networks to support routing in favor of MLX. They’re hurrying to redesign planned Campus rollouts with Fabric Connect. Not only do they get to keep the tried and true products they love, they get new ones to add to their collection. Then, there are those people that have bought from our companies at one point or another, but strayed away because of uncertainty, lack of prominence, etc. They’ve come to see if the new Extreme is going to be a legitimate alternative or just another one hit wonder. They listen not for hints of what we might do with current portfolios, but for clues about our ability to integrate so many acquisitions in a short time and execute on the vision we’re painting. New compilations, like the Secure Automated Campus, show that we can take the roots of what made each of our individual companies great and deliver something even better as a super group. These people are walking away energized having rekindled an old passion. They’re looking at upcoming projects with an eye toward the resurgence of Extreme as a leading vendor in their networks. Finally, we have the next generation of customers. You can’t make 3 significant acquisitions in a year and have 10 consecutive quarters of growth without raising some eyebrows. So, people are coming to see what all the buzz is about. They often haven’t thought about Extreme in years…if at all. They aren’t familiar with our products and solutions. So, they listen for the first time without any particular bias; and without fail, they’re pleasantly shocked at what we have to offer. It’s been so long since they’ve had any viable alternatives for their network that they’re almost in disbelief that one this good exists. They challenge us. Not in a confrontational way but to engage with them in a deeper discussion outside of the event. We’ve peaked their curiosity, and they’re eager to learn more about this new alternative and how they can potentially leverage it to drive better outcomes in their own companies. Prepare for the Next Release! FOB released their first album in 2002. They’ve become major rock stars since with a massive following. So, it’s inspiring to see the similarities in our audiences. Extreme NOW is just our opening act. Our biggest hits are yet to come. 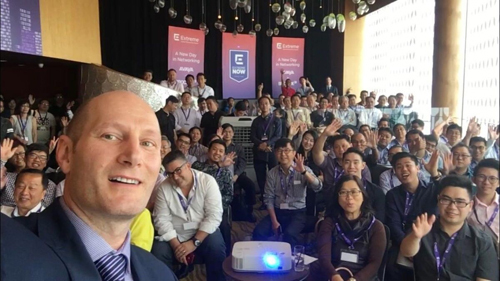 Extreme NOW events are planned through April 2018 leading up to our first-ever global user conference, Extreme Connect. Sign-up for an upcoming Extreme NOW event near you to join the party!